Want A Party Like This? Proudly serving Northern Virginia, DC, and Maryland! A whirlwind of hilarity & unbelievable magic!! You are one step closer to hosting the best party ever. 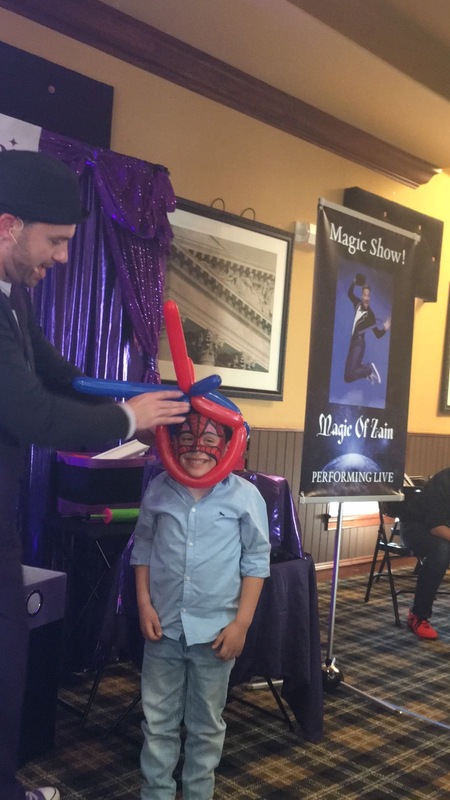 Our team offers the highest quality kids & family party entertainment! give you peace of mind with unforgettable memories. Please see our reviews & videos! Voted #1 year after year!! Where your child is the star of the show! Wonderfully entertaining for children and adults alike! Very prompt, professional, and courteous! Zain was amazing! Exactly what I hoped for! He kept the kids engaged and laughing the entire time. I had so many parents tell me even weeks later how much their children loved this party. 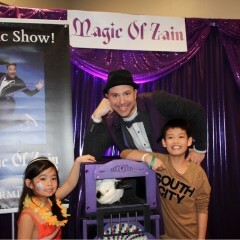 My kids and I had a great time , thanks Zain for a wonderful show! Kids and even adults had tons of fun! Zain and Nicole are great! Amazing professional entertainment and fun!!!! Worth every penny! Zain and Nicole were amazing, professional and so easy to work with. The show was flawless and entertaining for not only the the kids but the adults too. 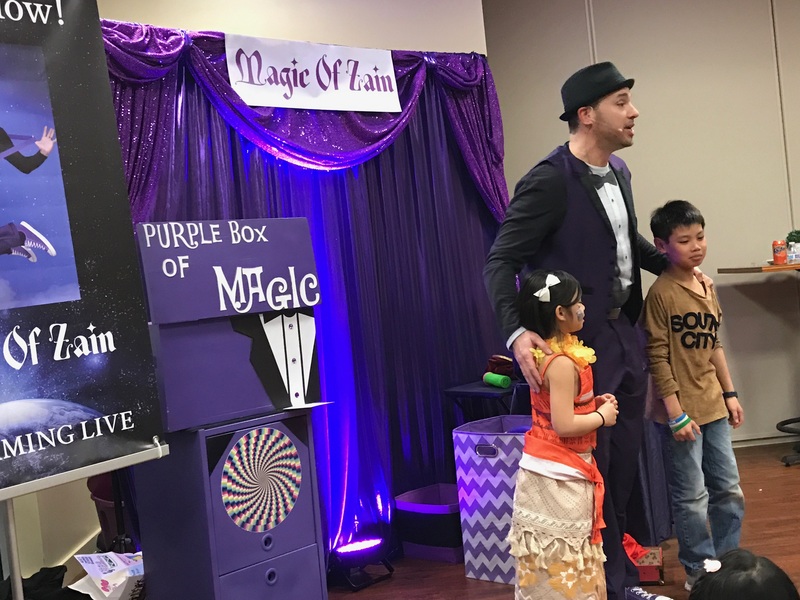 Zain the Magician had the kids captivated by his magic and roaring with laughter. We cannot thank them enough for putting on an amazing show and making this a birthday my kids will never forget. P.S. I never take the time to write reviews - that should be the review in itself! Thanks for taking the time to write a review Keri! Much appreciated. I celebrated my daughter's 5th birthday at her day care. We included the 3 year olds as well along with the 4s and 5s and they had an absolute blast! Thanks for your review Kathy! All kids as well as adults had much fun by the amazing performance. We were surprised by tricks and also attracted by his rhythmical performance. Best birthday entertainer in Dc area. This duo was great. They were on time and set up quickly. Parents and kids loved them both. A definite hit! Thanks for the great review Samantha! Zain and Nicole were consummate professionals. They definitely knew how to entertain my crowd of about forty kids 6 and under. Would book them again in a heartbeat. So glad that we decided to go with the Magic of Zain for our children's birthday party. Everyone loved it and could not stop talking about how great the show was. The kids are all still talking about their favorite magic tricks. Zain (and Nicole!) are worth every penny! Thanks for reviewing us on GigSalad Rachel! Zane was Awesome! He entertained a lively group of Cub Scouts. He kept them entertained and having a great time for 45 minutes. No easy feat! Everyone enjoyed the show kids and adults alike. He was professional,friendly and had a great show! I highly recommend him! Zain did a fabulous job entertaining my daughter and her friends for her 6th Birthday party. The parents enjoyed the entertainment as well. I would highly recommend him for parties. Thank you so much for the great review Tracy! Zain was wonderful, he was funny and entertaining. I recommend him for your party. Zain and Nicola are an awesome pair! They setup and took down a great “stage” in minutes. They were kind and professional. The show was excellent and had the kids mesmerized. They far exceeded my expectations. Highly recommend! It was awesome, my 5 year old had a blast, all the kids laughed so hard it was great, thanks for such a wonderful experience. 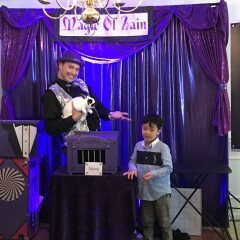 I hired The Magic of Zain for my daughter's 5th birthday. From the time I booked my party until the end of the party they were VERY respectful and professional. What a enjoyable experience. Kids were screaming from been exited! Thanks for the great review! We strive to provide excellent kids' party entertainment at a reasonable price. Sorry you found our third party GigSalad inconvenient. We will address this right away. 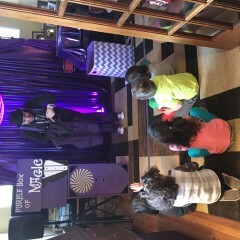 My six-year old and his friends loved Zain and his performance! Outstanding! We had a blast. Thanks for the great review Sharen! When I looked around the room during my six year old sons birthday party the kids were having a fantastic time and the parents looked equally amused! Zain and Nicole provided seamless service and everyone had a great time! Zaine & Zara were great! Zain and Nicole were accommodating and easy to work with. They ensure to communicate frequently regarding event and any needs that they can help you with. Zain can just keep the kids focused and entertained. At the end of the party though there were many children Zain made sure that each child had a balloon twisted object. Smiles everywhere. Thanks Zain and Nicole for your professionalism and entertainment. Magic of Zain was such a great show/team! The kids had a blast for their birthday party and Zain and Nicole were wonderful. The show was so funny, the parents loved it too. My kids (turned 8 & 6) are still talking about some of the magic tricks. Very professional, friendly and kind team. We ended up having more kids than expected and Zain and Nicole spent more time with them to ensure they all got balloons, face painting and time to talk to him after the show. Thank you for making our kids’ birthdays special! 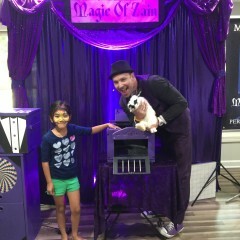 Magic of Zain was awesome. His performance kept the kids attention and they participated in the show. Children's laughter was heard throughout the entire show. Magic of Zain team is awesome and fantastic! My Wife and I hired them based on the reviews online. Glad that we made the right decision!!! We went for their Gold package. Both Zain and Nicole are very nice, and professional. They arrived on time. The moment we met them, the show was on. You will know what we mean when you meet them at your party! Zain knows how to keep kids and adults entertained at the same time. The show was interactive. Kids were bursting out with laughter and their parents in the room were having a great time too. The kids at the party ranged from 5 years to 12 years with the average age being 7-8, and all of them had fun time. Zain noticed that our kid is shy, and let us know in advance the best time to call him out on stage. It worked out well since our kid was warmed up before he was called out, and had a great time during the act. Zain was entertaining kids while twisting the balloons too. Nicole did a wonderful job with face painting. She was very detailed and had lots of patience. At the end, she made sure she did not miss any kids that wanted face painting! We have been to parties where kids are turned back due to lack of time. Some of our friends were very pleased and are planning to hire the Zain team for their kids birthday. Wow, great review! Thanks for the love!! Zain is an amazing magician!!! He is so great my daughter has requested him for her past two parties. His first performance was phenomenal and his second was just as good and he did different tricks. He is a true performer who cares about his clients. I could also see him in an adult setting as well. I would recommend him for your next event. You cant go wrong with Zain, he is easy to work with and puts on a wonderful show. Great time at corporate holiday party! Zain was a hit at our holiday party! Every year, we get our employee’s families together to celebrate the holidays. Zain did a great job entertaining the kids and adults, too. It really set the scene for the rest of the night. I’m really glad we had the face painting, too. Even adults got decorations on their arms! The event was greater than I anticipated. 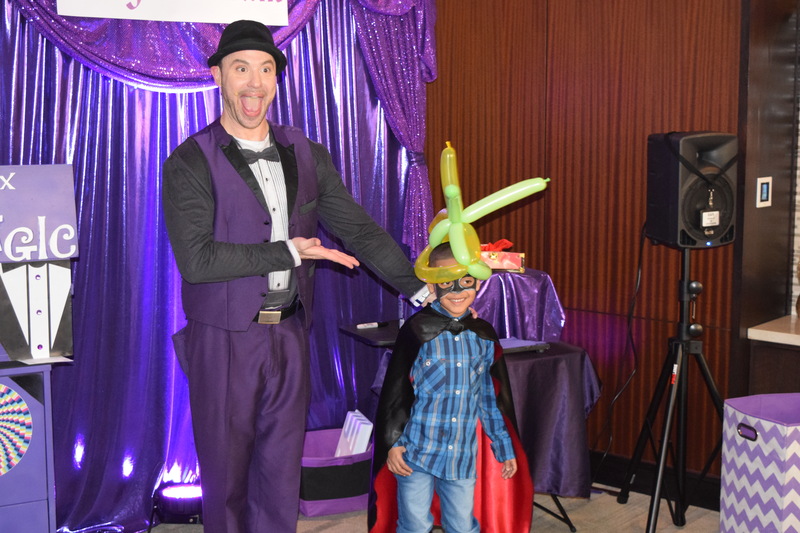 Children and adults enjoyed the magic show and the face painting and balloon twisting was a great addition. Best part was me being able to sit back and enjoy a perfectly planned event without having the stress of planning myself! Without a doubt 5 stars and if I️ could give more, i would!! Ps - music was a great touch - kids loved dancing around while waiting in queue. We had a great time and the magic show and face painting was awesome! 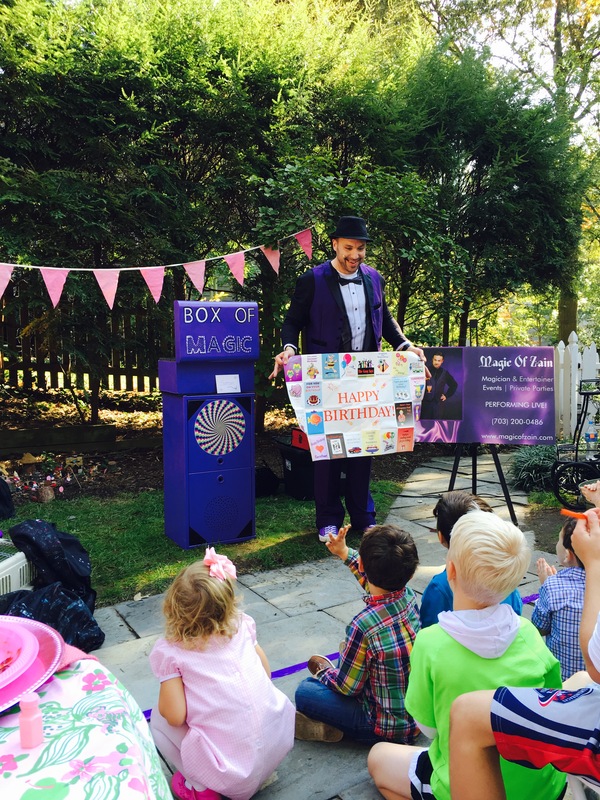 We hired Zain for our daughter's 4 year bday party and he was terrific! Both Zain and Nicole were very professional and helpful throughout the entire process. Zain was very energetic and funny. We had 30 kids (and over 30 adults) and Zain managed to keep all of them engaged and entertained throughout the entire 40-minute show. 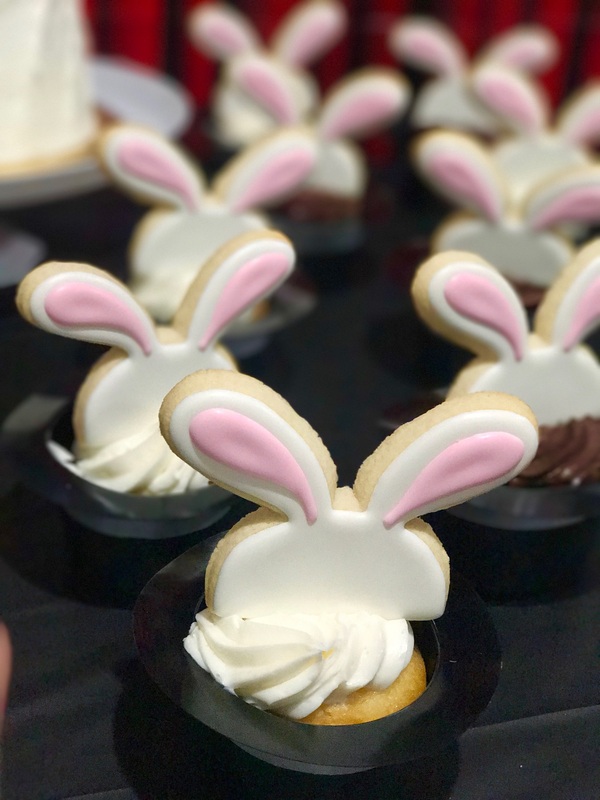 I'm still hearing from kids and parents about what a great time they had at the party. I highly recommend him for any of your events! Great entertainment for a room full of children! Zain & Nicole were very professional in the communications leading up to the event - they made sure we were comfortable with the flow of the day and answered all of our questions. On the day of, they were on time and set up a beautiful backdrop - with a full sound system, gorgeous scene and a dedicated face painting area, we were thrilled. 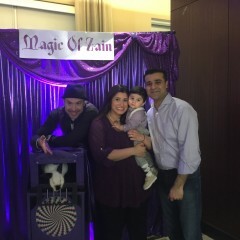 I would highly recommend Magic of Zain - both the children and the adults enjoyed a fabulous party! The magician was very entertaining for the all ages that attended. I saw small kids from 2 years to 13 years old smiling and laughing. 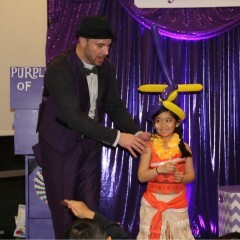 The entire show was professional and the kids were participating in the show with the magician. Very pleased with the performance and display. Zain is a great performer and very professional. Zain and his wife Nicole arrived on time and set up promptly. The group he was performing for was a varied group of intellectually disabled adults. Zain did a fantastic job entertaining and making the group feel like part of the show. I look forward to working with Zain and Nicole again in the future. 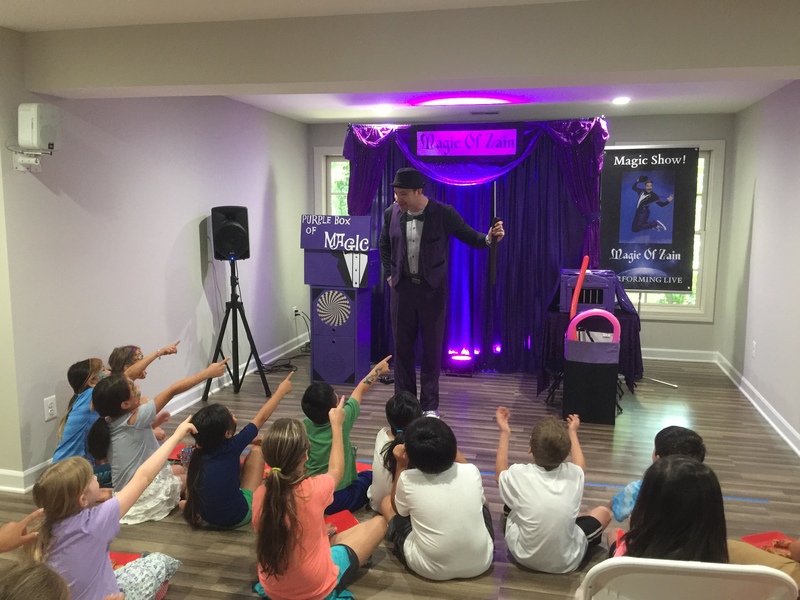 Magic and humor combined for an entertaining afternoon birthday party for 12 and 13 year old girls and their parents. A good time was had by all! Thanks so much to Magic of Zain! We had a great 1st birthday party for my daughter. Her cousins, friends and the adults were laughing and loved the magic. Definitely would recommend Magic of Zain for any age group party! The Magic of Zain show was a wonderful experience from the face painting, to the magic, to the balloon twisting! 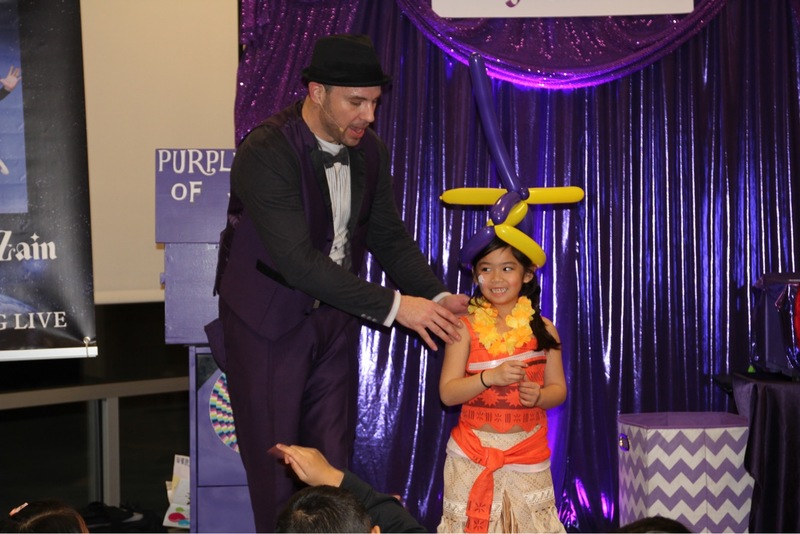 They were patient and personable and entertaining for the whole party - kids of all ages! 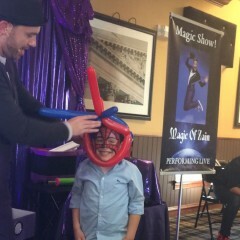 Both my boys are now running around having their own "magic shows" and it does my heart good to see them so happy. Thanks so much for the wonderful memories!!! WOW... Zain and his wife are awesome. 40+ adults and 10+ plus kids. Everyone enjoyed the show,facepainting and gallon twisting!! The kids want to see Zain again!!! Thank you so much for the amazing review! Here at the Magic Of Zain, your satisfaction is music to our ears. Highly recommend - my children were thrilled and we got so many compliments from everyone in attendance. Great show for young kids. Zain and Nicole did a spectacular job! All the guests - kids and adults were entertained the entire time! Face painting looked amazing. Everyone said this was the kids party of the year! 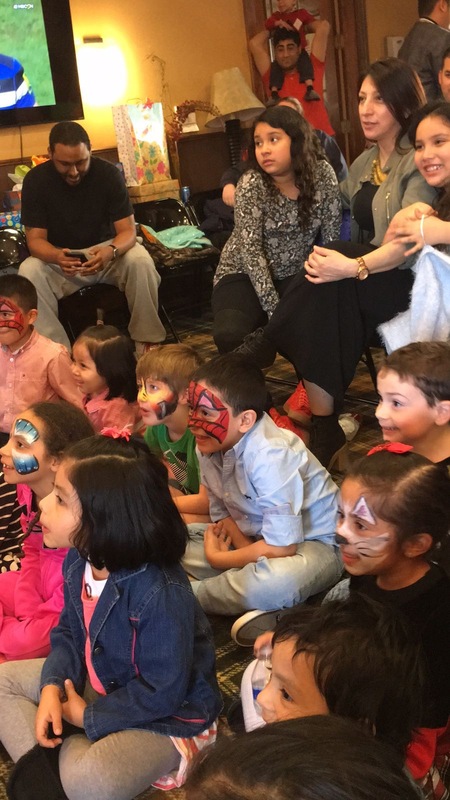 Zain was wonderful with the kids and adults with his magic show and Nicole was wonderful with face painting! 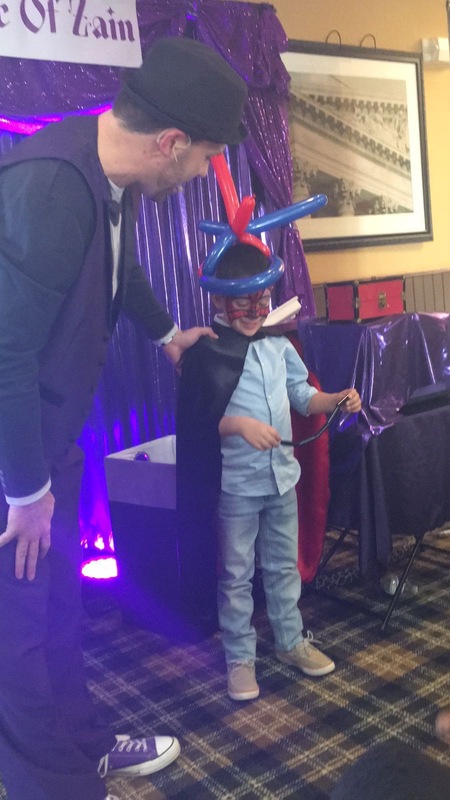 A fantastic and magical 8th birthday party!! This adorable, funny, most friendly husband and wife team has my highest recommendation possible for anyone's next big event!! You will not regret it!! From face painting, to the magic show then balloon twisting, the kids all had a blast!! Everyone was loud, they were engaged and most importantly the sound of laughter echoing throughout my home was telling me everyone had a blast!! Thank you so much for making Megan's 8th birthday party a magical one. 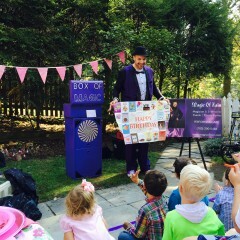 Magic of Zain was a hit at my sons 1st birthday party! Thank you for a very wonderful and funny afternoon of magic, face painting and balloon twisting. The kids were talking about the tricks after the show was over. Thanks again! My daughter had a great birthday party thanks to Zain and his wife Nicole. Zain did the magic and balloon twisting. Nicole did the face painting. The show was excellent and had the room full of 7-year-olds howling with laughter. The face painting and balloon twisting were also topnotch. The only thing I'd have done differently in hindsight was to do the show at the beginning when the kids arrived (instead of after the face painting). We had 20+ kids who were a bit all over the place until the show started. Overall, it was a very memorable birthday party and different from all the bounce house birthdays we've been going to. My daughter loved! Zain and Nicole were very flexible in working with our program. The kids loved the show and can't stop talking about how much fun they had. 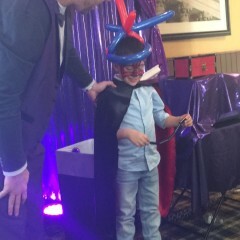 Thank you for arranging a wonderful magic show for my son's birthday. Zain was just superb - good at magic but, just as important, good with kids. There were roars of laughter coming from the crowd. The kids' eyes were filled with anticipation waiting to see what would occur next. Nicole did a great job on face painting as well. Thank you very much. It's great to be 5! 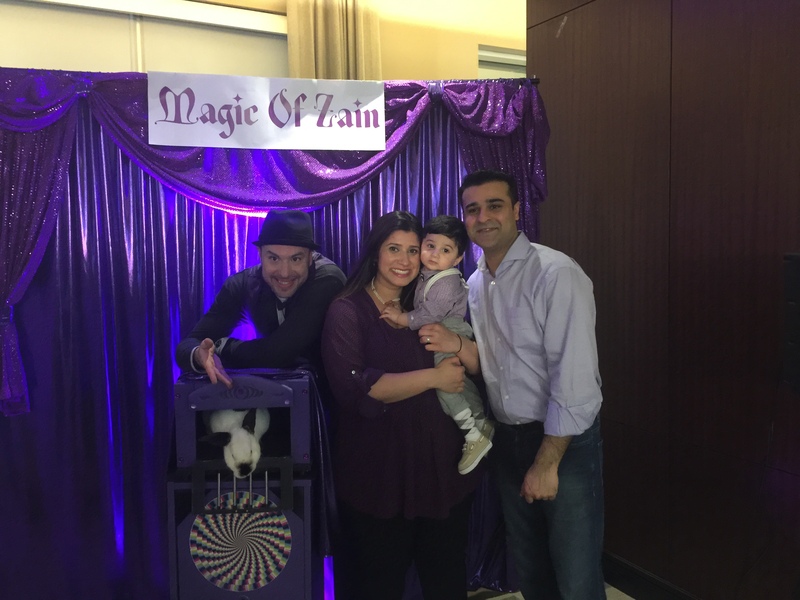 Zain made our son's first birthday MAGICAL! Our son and his friends really enjoyed themselves which in turn put a smile on my face. I definitely recommend Zain for your next event! Everyone loved the show! Can't say enough good things. Zain held the children's attention all the time! That is a big achievement for sure. 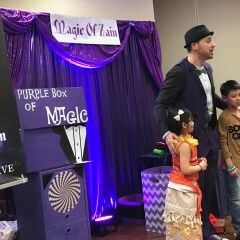 Zain did a magic show for my son's birthday party last weekend. All the kids there enjoyed it very much. Some of them were asking his details so they could get him to perform at their own party. He also did balloon twisting and Nicole did face painting. Her designs were all very detailed and professional looking. Best magician and face painter in town! Zain and Nicole were fantastic at our son's first birthday party this weekend. The children and adults were entertained and laughing the entire time. We have had numerous friends ask where we found the entertainment. Zain and Nicole's energy is contagious and really sets the tone for the party. We cannot rave enough about this phenomenal team and would use them for every party if we could. Fantastic! Best magician we've ever hired! 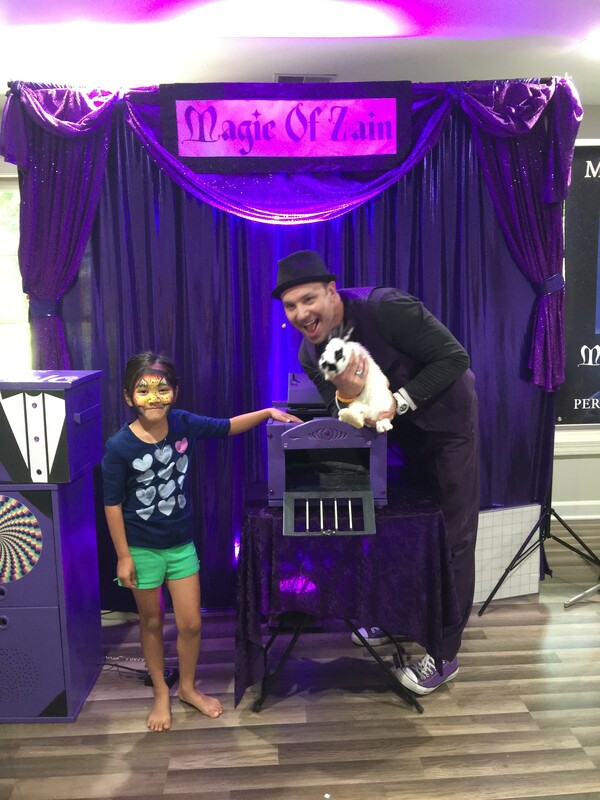 I would highly recommend Zain and his wife for face painting and performing magic show. They were both super nice and had positive high energy to everyone and especially to the kids. All 50 kids at my party got custom balloons and face painting. They're worth every penny! Book early since they get booked pretty fast. Thank you so much Zain for making my daughter's birthday so memorable. Zain and Nicole were a hit! Everyone at the party raved about the magic show. The only complaint is we wish it went longer!!! magical birthday presentation. All the kids( adults too) enjoyed it very much, a lifetime memory. Face painting was awesome by Ms. Zara They are highly professional. Magic of Zain is GREAT!! The kids at my son's birthday party were so excited and had lots of fun:) The face painting was very nice also! Highly recommended!! 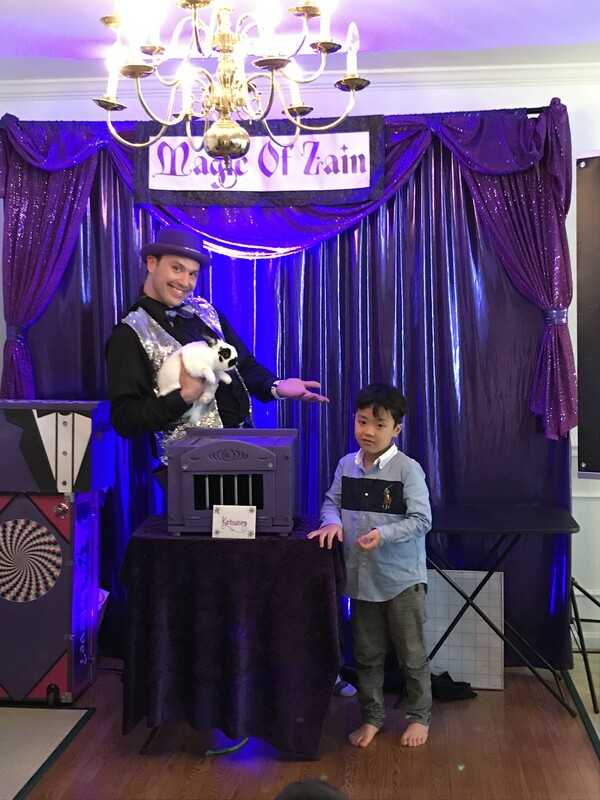 Magic of Zain exceeded all of or expectations at my sons party. Zain and his wife were true professionals and took care of everything. The face painting, the show, and the ballon animals were all amazing:) All the children were able to participate and laughing the entire time. I would have them again in a heartbeat! Thank you Magic of Zain!!! All of the kids were captivated and laughing so hard...even the adults thoroughly enjoyed him! We got a ton of compliments. Both he and his wife were great to work with, I would highly recommend him! Very entertaining, friendly, and had my very shy 2 year old excited and happy as can be. Overall success. 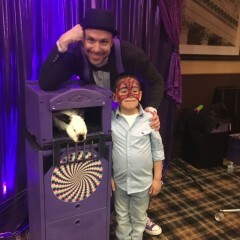 My first time seeing a magician with my son and I def recommend him for any event. 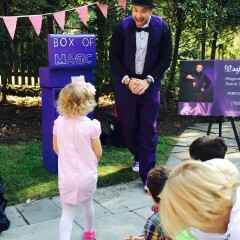 All the kids and adults enjoyed the magic show at my 4 year old daughter's birthday party! he's prompt, professional, and hilarious!! The audience laughed from beginning to end!! Highly Recommend!!! We hired Zain for our son's first birthday. From the start Zain and his wife/assistant were exceptionally helpful with questions and planning after regular work hours. The week of the event, weather was calling for snow/ice. Zain and his wife were ready to work with us to switch the date around, show up extra early, do whatever needed to be done to make sure the event would still be a success. Zain personally called me to ease my worry, they really are top notch. The show was everything the kids and parents could've hoped for! His show was so inclusive, he had everyone from the 10 year olds to our two year old laughing so hard and fully engaged. He fully engaged all the children and even the parents in the jokes and fun. I would 1000% recommend The Magic of Zain, their customer service and genuine concern for a successful event is worth every penny! And it certainly was a great help to have one less thing to worry about for this party planning Mom. We loved the show and will look forward to maybe hiring them again for other birthdays! We hired Zain for our son's 1st birthday, understanding that there would be limitations in comprehension for him and the other younger children. With this understanding we had a blast. The children, and the adults were fully engaged and really enjoyed themselves. His desire and thoughtfulness to insure the happiness and inclusion of every single child there was what really made the party exceptional. We have nothing but incredible things to say about Zain, and his wife/assistant. Their service and professionalism was second to none, and would would absolutely hire them again. *side note* Todd another reviewer on this website left a two star review claiming they attended our son's party. We don't know any Todd's, nor was one invited... you should disregard, or assume that this is a competitor trying to sully the name of a great performer and magician. Zain is awesome! HIGHLY RECOMMEND. Hired him and his wife for my daughters 6 th bday party . It snowed and they came early and set up relieving my anxieties. The face painting was amazing. She is a true artist . Zain captured the audience from the start with his humor and amazing personality. He had the kids and parents in awe! Everyone enjoyed Zain's magic. He worked the room and did many mini performances. Highly recommend. Zain and Nicole were great from the very first conversation to the evening of the performance! They both were professional, communicative, and put on a fantastic show for a lively group of 4-5 year old kids (and their parents). 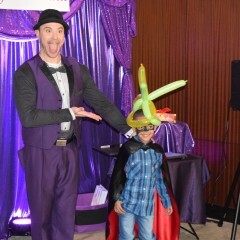 Zain is an excellent magician and his comedic performance was funny and appropriate for the age group. He gave the right amount of attention to the birthday girl, and included her friends in his performance. All in attendance commented on how great the performance was, and we would highly recommend Zain for your next party or celebration. all are enjoyed entire show. 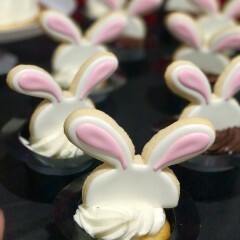 The kids LOVED the REAL RABBIT! 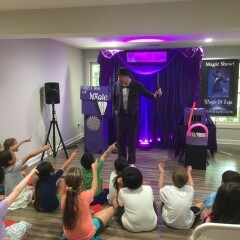 Thank you for a very entertaining and age appropriate magic show! The bunny was the hit of the entire show having it go from a balloon to real life. The time frame of 45 minutes was perfect for their little attention spans and they laughed the entire time! Excellent job, Zain! 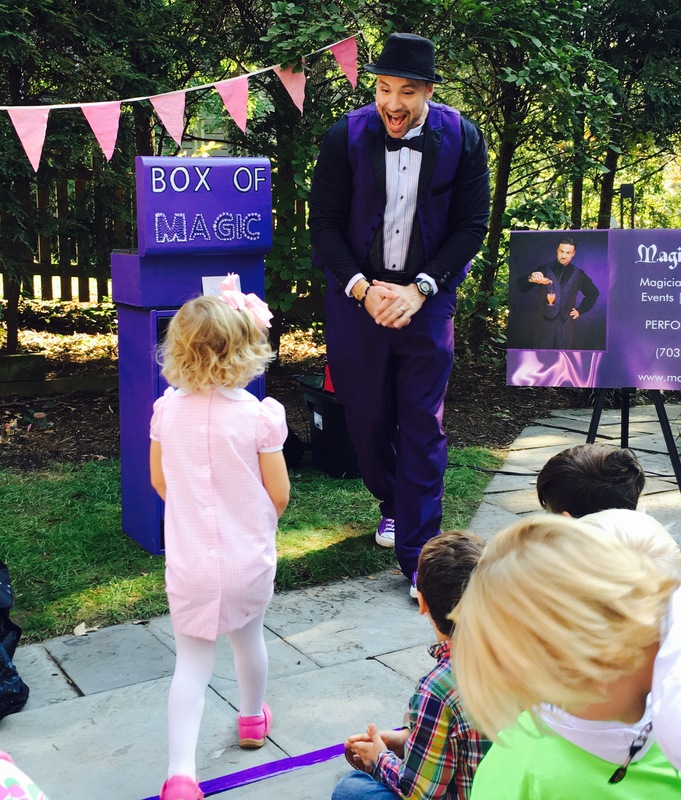 We hired Magic of Zain for a neighborhood Halloween party and the kids loved him! Our kids ranged from 2-10 years of age and Zain had kids and adults alike laughing and entertained. Very professional. Zain and Nicole did an amazing job! We hired them for a child's birthday party with kids of all ages. He kept their attention and the kids LOVED the show! It made our party spectacular! They were on time and extremely professional. Would definitely recommend them and hire again! Zain is full of energy. 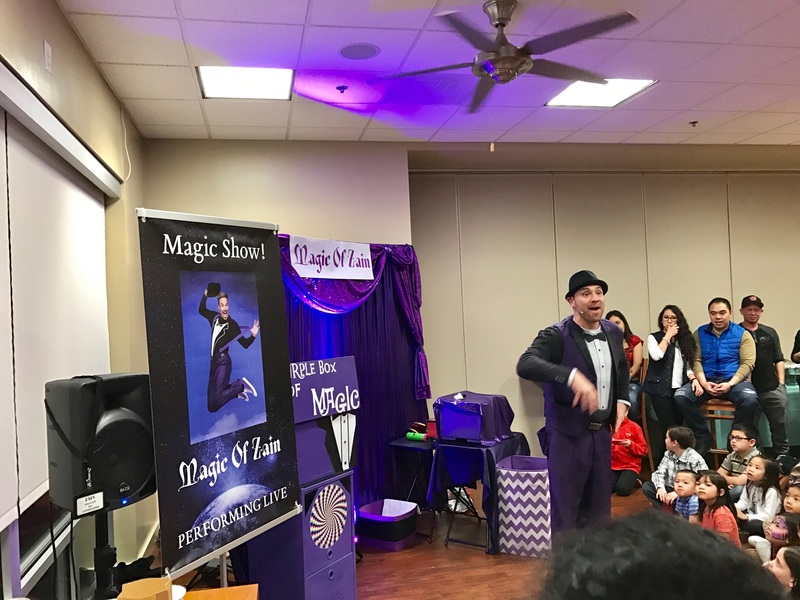 The magic show was fun and the kids had a blast. I highly recommend zain for your parties. Zain was funny and great!!! It was an amazing show. He had the kids and adults amazed and laughing the entire show. We will recommend him to other parties. Some of the kids took his card to give to their parents and request him for their parties. Zain and Nicole did a fantastic job in engaging kids through out the party. Thank you very much !!! Krishna, you sure know how to throw a party! Thanks for choosing the Magic Of Zain for your upscale event. Awesome show! Zain is awesome! 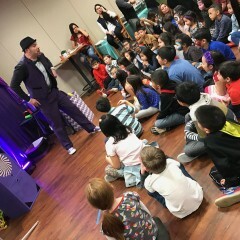 How do you entertain 23 second graders at a birthday party...and have everyone talking about how awesome the show was for days? The answer is Zain! My son LOVED it, all the kids LOVED being part of the show, everyone was amazed by the magic...including the adults! His humor and personality had everyone engaged and laughing (kids and parents), the live bunny trick had everyone amazed. We highly recommend the magic of Zain!! I’m sorry you had a less than 5 star experience. We’ve been in business for over 10 years, we serve hundreds of repeat customers yearly, and we strive to create the best possible entertainment experience for the community. Thank you for your input, and we will strive to improve accordingly. We had Zain & Nicole for our son's 3rd birthday party. All yhe kids had loads and loads of fun!!! Zain was just amazing with kids. Thr overall experience of booking the show was so smooth and they had been so pleasany to work with. Zain called me & informed me as tonwhat I can ecpect in the show and how yo time the event to have maximum entertainment and his suggestion worked out great! All in all, great experience!! My daughter and her friends had a blast with Mr. Zain. Very respectful, on time, and amazing entertainer. My daughter still talking about the fire on Mr. Zain wallet... Highly recommended!!!! I wish we could have more time at the party place. now thats what I call a party! My granddaughter had a great Birthday Celebration and Zain made it super special! 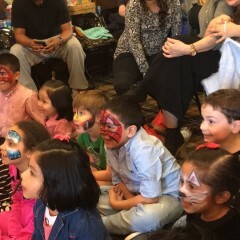 The kids loved Nicole face painting. They were extremely nice, patent and flexible. The Magic Show was interesting and spectacular! The children in the audience absolutely Love Magic Zain's performance. His show for my Son's Holy communion Celebration was fun, enchanting and entertaining. If you are looking for a great magic show of entertainment for any event, you really need to call Magic Of Zain. I have no words to express about Magic of Zain. Such a smooth start right from the start to the finish. 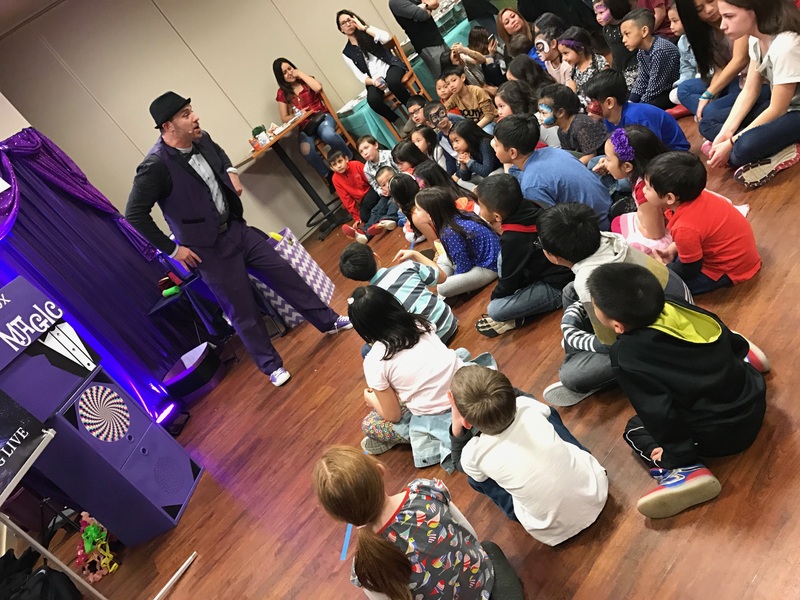 The magic show was very engaging for all age groups and was so relaxing to see the audience captivated throughout the event. 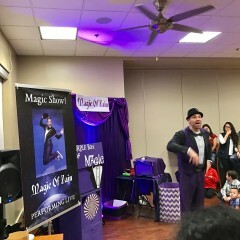 Best part is that kids were actually performing the magic and had a great time. Not to forget face painting time kids loved with Nicole who was very patient all the while. The package included balloon twisting as well for no extra cost which was like an added bonus and a short video of the show was cool too. And we could not ask for anything more. I highly recommend Magic of Zain to all party planners. Very enjoyable experience to one and all. There is something about ZAIN that sets him apart from other magicians, whether it’s his ability to relate to people from age (7-70), captivate and mesmerize his audience or his commitment to provide outstanding professional service, ZAIN is truly redefining the art of MAGIC. This was an innovative event, and an absolute pleasure working with your managment team! Zain's act took us into a world of mystery and excitement. We had a birthday gathering of about 40 guests and when Zain began his act, you could hear a pin drop. He captured the entire room. I would recommend him to anyone throwing an event of any size. Professional, witty, engaging....Zain is where it's at!! Thank You! I Love what I do...and do what I love!! 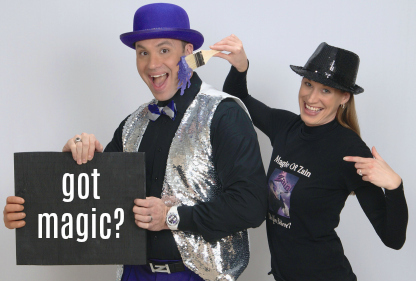 The Magic Of Zain is the top choice for family entertainment and Birthday party magic shows. Quality magic is our guarantee, and making smiles is our passion! 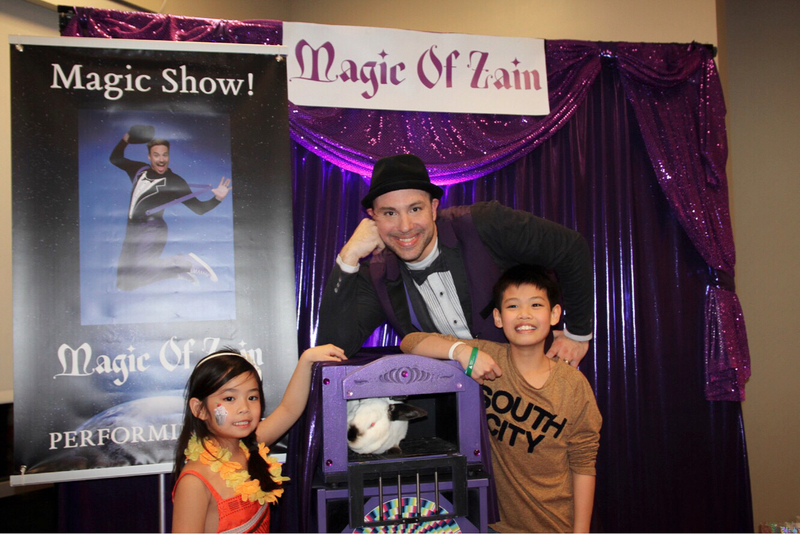 Zain is a highly experienced children's magician and features a high energy interactive magic show. We guarantee laughter and fun no matter what age! Our calendar fills up fast, so don't wait until the last minute to book. Reserve now, and officially become the coolest parent on the block!! We will make sure your event flows smoothly right from the start. shining star of the show! The Magic Of Zain will leave your guests buzzing and wanting more. . MAKE YOUR NEXT EVENT UNFORGETTABLE! ! 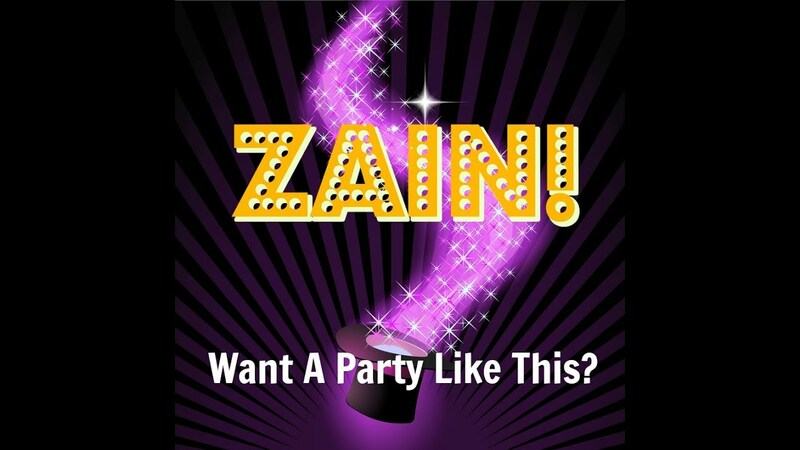 *Magician and speaker Zain specializes in turning events into celebrations. Bring class, style, and energy to your next event! 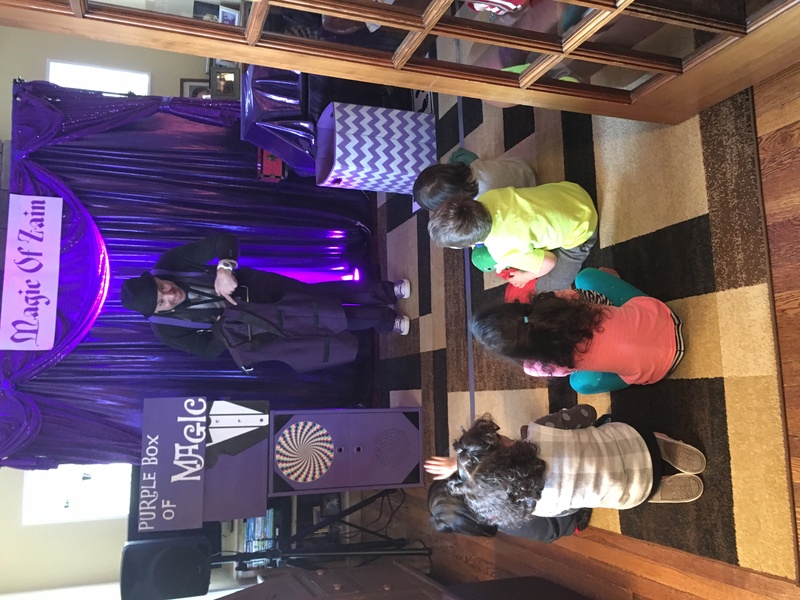 No matter their age or interests, everyone loves enjoying good magic, even more so when they get to experience it in front of their very own eyes. Zain is a world-renown close-up magic expert who will energize the atmosphere of your event and involve all your guests, producing a talked about buzzing occasion that will be remembered for years to come. performed at the highest level within his art. He also has performed for Faith based groups, National trade shows, expos, and fund raising events from coast to coast. Zain's high impact magic is simply astonishing and is suited for all ages. With his authentic artistry, he leaves the audience breathless. A world class champion illusionist, incorporating custom messaging and interaction, he has the right show for you. 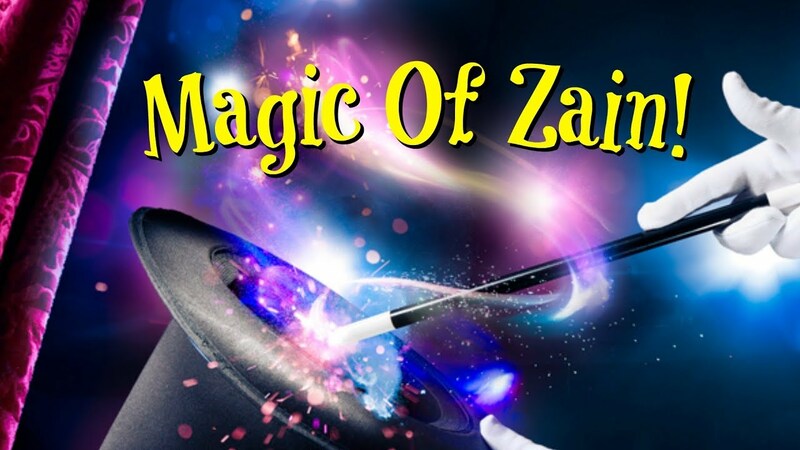 Zain will take you on a journey through other dimensions, with his unique blend of close-up magic, and large venue show production. With custom tailoring for any theme, they will be talking about your event for years to come! "Zain packed the house night after night"
"He just floored the the whole place." We are 100% flexible, and have performed in almost every situation! We have all production equipment for any occassion!